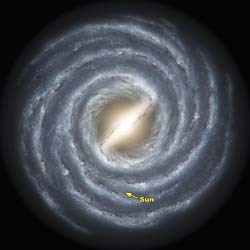 It surprises most people to learn that we astronomers don't have a good idea how massive our own Milky Way galaxy is. We have a pretty good idea about the masses of other galaxies, and we have a pretty good idea of the physical size of our galaxy. But we have a hard time measuring how hefty the galaxy is. Today, a new report on the mass of the Milky Way gives a new estimate of the mass of the Milky Way. It's down a bit from some earlier estimates, at a trim 1 trillion times the mass of the sun, a number that includes stars, dust, gas, and dark matter -- everything. It's a little like living in a dense forest, being tied to one tree, and trying to figure out how many trees are in the forest. You can estimate, but maybe you live in a dense part of the forest, and there are holes in other parts of the forest that you can't see. Maybe other parts of the forest are denser yet than where you are. You aren't even certain how big the forest is, although you can make some clever guesses. And imagine that most of the trees are invisible (like dark matter). You may see other forests, and you can guess how dense and how big they are, but you'll still struggle to get a good handle on your own. And that is the situation we find ourselves in here. The new measurements use about five times as many points as earlier measurements, and that means the estimate of the Milky Way's mass is more likely to be correct. But there are still many uncertainties that are hard to quantify, or even to explain. So, it would not surprise me that, in a few years, a new measurement comes out that is different yet again from the 1 trillion times the mass of the sun. On Sunday evening, the Phoenix Mars Lander safely landed in the Martian Arctic to begin a three-month search for water on Mars. It was a picture-perfect landing, as evidenced by the picture above. What you see is the Phoenix lander dangling from its parachute, and you can even see the parachute lines! This picture was taken by NASA's Mars Reconnaissance Orbiter, a satellite snapping pictures of Mars. It was a technically-challenging photo, and the fact that it worked shows how very careful diligence can bring you excellent results. Future Mars missions can learn a lot from the care and time the Phoenix team put into their landing. Phoenix was sent to the Martian Arctic to look for water ice. On Earth, wherever there is water, there is life. And we know there is water ice at Mars's north and south poles. Phoenix will not be able to search for life itself (unless a Martian Yeti or Rabbit happens by). Instead, Phoenix is going to look for water, study the chemistry of the soil, and allow scientists to estimate how suitable a habitat the Martian poles might be. If it seems like a possible habitat, future missions geared to look for microbes may look at Mars's poles. If it is not a great habitat, the search will go elsewhere. 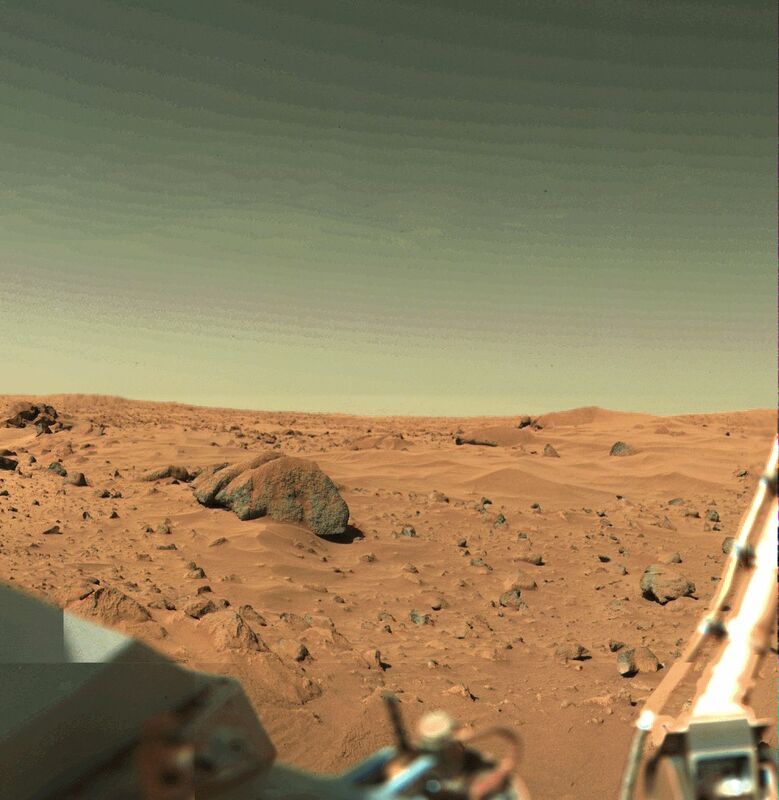 To me, it is neat to see the pictures of the Martian Arctic. 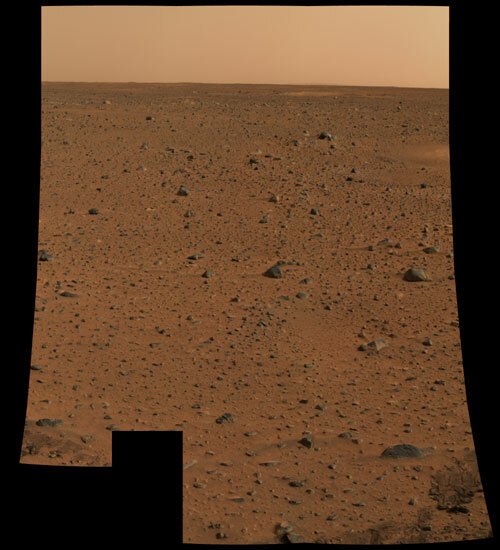 NASA's first four probes to land on Mars all saw similar terrain (click on a link to compare the views); Viking 1, Viking 2, Mars Pathfinder, and the Spirit rover all showed us very rocky and dusty areas. It wasn't until the first pictures from the Opportunity rover that we saw a different face of Mars -- a flat, broad, sandy plain devoid of the jagged rocks previously seen. And now Phoenix has seen yet another face of Mars. And there is much of Mars we have yet to see -- massive volcanoes with extensive lava flows, ice caps, and giant chasms. 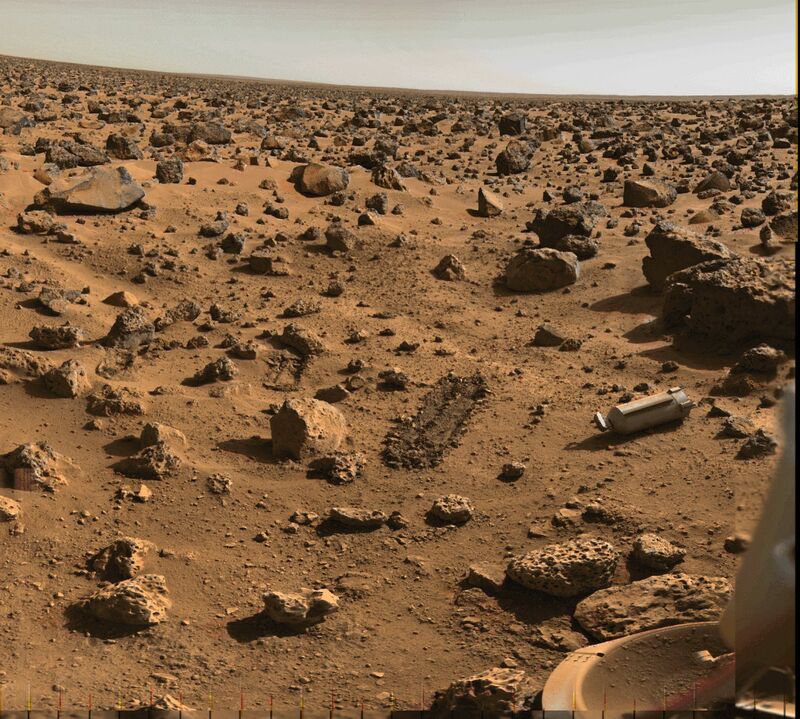 If we were Martians studying the Earth, then a roughly equivalent exploration scheme is that Viking, Pathfinder, and Spirit all landed in different deserts, Opportunity landed in the Great Plains, and now Phoenix lands in Siberian tundra. There'd be a lot more of Earth to see! Congratulations to the Mars Phoenix team. Now the real work begins -- about three months of work time before the long Martian arctic summer ends, and the cold and dark of Martian fall and winter set in. Monday is Memorial Day here in the U.S., the day when we remember those dead who served in the armed forces. I grew up not too far from Gettysburg, and a visit to the National Cemetery there was always a stark reminder of the price that was paid and continues to be paid by others so that I and others may have the opportunity to live free and safe. I owe a debt deeper than I can repay to those soldiers. In spite of the big holiday, many exciting astronomy things are afoot. On Sunday, the Phoenix Mars Lander will try and touch down safely on Mars, after which it will look for signs of life in the water ice near Mars' polar ice cap. Only about half of Mars lander missions have succeeded; the landing sequence is tough and has to be fully automated, and human errors seem to be quite common. I'm optimistic, though. I know some of the people involved from my time at Arizona, and they are being exceptionally careful with this spacecraft. Best wishes to the Phoenix team for a safe landing! In just 1 1/2 weeks, NASA's newest space observatory, GLAST, will be launched. GLAST stands for "Gamma-Ray Large Area Space Telescope," and will be the most powerful gamma ray telescope ever. Gamma rays come from very energetic events (like supernovae and black holes), as well as from nuclear reactions, so GLAST will be able to shed some light on some of the most extreme physics in the Universe. When a star ends its life by exploding, it tends to be a while before we see anything on Earth (and this is ignoring the millions of years it takes light to get to Earth). Because we don't know in advance which star in the Universe is going to explode when (as there is no "Upcoming Attractions" posting on the Universe's blog, and psychics continually fail to warn us of these things), we tend to see explosions after the fact. But even if we knew when a star was going to explode, it would be hours after the actual explosion before we saw any light on Earth. When a massive star nears the end of its life, its core engine (a nuclear fusion reactor) is busily fusing silicon into iron and nickel and cobalt. These elements have absolutely no energy value, so they form a lump of inert ash at the center of the star. When the lump gets big enough, the forces between atoms can no longer counteract gravity, and the core collapses into a neutron star or a black hole. Suddenly, the star finds it has no support in its middle, and the star begins to collapse inward. All of the inward falling material collides, causing a shock wave to go rushing outwards toward the surface at the star at speeds of 10,000 miles or more per second. This shock wave is also probably driven by energy from a stream of subatomic particles called "neutrinos" that are formed by the collapse of the core of the star. When the shock wave reaches the surface of the star, it breaks free in a blinding flash of X-rays and ultraviolet light, as the first energy from the star being ripped apart is released into the empty vacuum of space. But even though the shock wave is going at these very high speeds, it can take the shock wave a long time to reach the edge of the star. The stars that go supernova can be almost a billion miles in diameter. A shock wave starting at the star's center can take 14 hours to reach the surface of such a star! So, for at least half a day after a star explodes, we on Earth have no clue (in the form of light) that the star has exploded. Even after the explosion, it often takes days for us to notice anything on Earth. The supernova explosion gets brighter for several days as the shrapnel from the star expands outward, exposing more and more of the bright debris to view. Then the debris starts to cool, and the supernova begins to fade away (though radioactive decay from elements created in the explosion help to keep the star from completely fading away in a matter of days). On Earth, the supernova appears as a point of light that didn't used to be there, and someone has to be looking in the right direction to see it. Because of this, most supernovae are discovered only around the time that they reach their brightest point, which can be days after the explosion. Yesterday, NASA announced that their Swift X-ray telescope had discovered the break-out flash of a supernova. The telescope was looking at a galaxy when a bright X-ray "flash" was observed. Since part of Swift's mission is to look for flashes of X-rays (most of which come from gamma-ray bursts), the telescope immediately alerts interested astronomers around the world that a flash has gone off. After the alert, many professional telescopes went and looked at the spot of the flash, and were able to catch some of the earliest light ever to come from a supernova explosion. 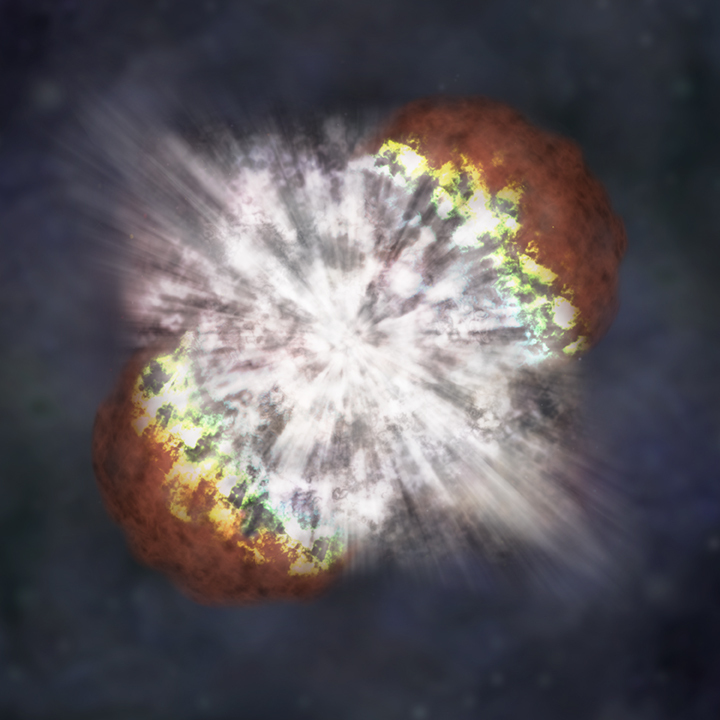 The picture above shows the X-ray picture of the supernova (top) and the optical-light picture of the explosion (bottom). This research is interesting, because it allows astronomers to explore some of the earliest stages of a supernova. It was also very lucky, because the telescope happened to be looking in the right place at the right time, and the typical galaxy only has a star explode every few decades or so. But is the discovery important (the press release calls this supernova the "Rosetta Stone" for understanding exploding stars)? Probably this is not going to be a crucial piece of data in understanding supernova explosions. The X-ray flash was expected, and now it has been observed, which does confirm one part of the theory of exploding stars. But it is hard to see that we will learn anything new from a single event. The theory of exploding stars seems to be pretty solid, and what we tend to learn from the earliest stages of a supernova is mostly what the star's outer-most layers looked like, and we already study the outer layers of stars (it's what we see when we look at them). Yes, there are things to be learned, but these are almost certainly just details, not grand over-arching themes. But a cool and lucky find, nonetheless. This discovery would be great for someone interested in the psychology of astronomical research. Since many different research groups got notification of the X-ray flash, they all scrambled to produce papers and get credit for the discovery. There are grumblings under the surface about the group getting credit in this press release, but there are also good arguments for why they got credit -- I don't know enough to have a well-informed opinion. And the personalities in competing groups are always continually clashing, so there are some, um, colorful opinions floating around. Anyone who claims that scientists are a completely dispassionate people are wrong, and this particular discovery is a great piece of evidence that human psychology plays a large role in science. So you want to be an astronomer? While reading through our daily postings of new astronomy articles, I ran across this article describing the steps needed to become a professional astronomer. The article was written by Duncan Forbes, a professor of astronomy at Swinburne University in Australia, though the advice is just as relevant here in the U.S. The article will appear in Mercury Magazine, the magazine of the Astronomical Society of the Pacific. This is a well-written and accurate article, with the caveat that it is written for people wanting to become a professional research astronomer. There are many other astronomy-related jobs that you can get via alternate career paths. Last weekend saw the graduation ceremonies here at the University of Texas at Austin. The astronomy undergraduate class this year performed very well, winning several awards. The top student this year was Sarah Miller, who not only snagged several local awards, but also a Rhodes Scholarship. That's VERY impressive! Congratulations once again to all of our astronomy graduates, and good luck in your future endeavors! When dealing with predictions, sometimes some very minor changes to your input can make drastic changes in the output. For example, a colleague of mine is running several simulations of stars about ten times more massive than the sun. He's making minor tweaks in between simulations. Sometimes the star loses matter a little faster, sometimes a little slower, sometimes the star is spinning faster, and sometimes slower. At the end of the simulation, the star dies. Sometimes it explodes as a spectacular supernova, which rips the entire star apart (like in the artist's conception above), and sometimes it forms a white dwarf, a pile of glowing ashes that slowly fades away. Very minor tweaks to the inputs make a big effect at the end -- either a big explosion, or a fading whimper. These differences aren't because we don't understand physics. We understand it quite well. In fact, these very small differences to the inputs make very small differences in the star throughout its entire life, up until the very end. But the star is straddling a fine line dividing two very different fates, and we don't know which set of inputs is correct, because we haven't measured them accurately in real stars. Or maybe they are all correct, so that in the real Universe, some stars ten times more massive than the sun will explode, and some won't. My point is that we understand the structure and the evolution of stars very well, with some points we aren't sure about (like how fast stars lose matter as they age, or how fast they spin). Astronomers will have giant arguments at conferences and in papers over these uncertain points, but if you look at the entire lifetime of a star, these uncertainties make very small differences. Eventually, though, there comes a point where the difference becomes huge. We see the same thing in our daily lives here on Earth with regard to the weather. If you compare forecasts coming from different computer models that treat the inputs slightly differently, the forecasts will often agree quite well in the short term, even up to a few days. Beyond that, the models start to show differences. And if you run detailed weather forecasts months into the future, they will completely disagree. This isn't because we don't understand the basics of weather forecasting; it's because the small details can make a big difference over time. So, when you see scientific studies coming out with widely different conclusions, we need to be careful on how we interpret those results. Some people claim that different conclusions mean we don't understand anything about physics or medicine or climate. That idea is wrong. Mostly, we have a pretty good understanding of the big picture, but the details remain to be filled in. And while those details can make a big difference far down the road, it doesn't mean that our theories are useless in the meantime. Image Credit: NASA/CXC/NCSU/S.Reynolds et al. ; NSF/NRAO/VLA/Cambridge/D.Green et al. Have you ever had a time that too much hype can take the fun out of something? Like the Superbowl, or these presidential primaries that are talked about for weeks as "crucial turning points," and the results, while important, are far from crucial or deciding? Yesterday NASA had a press conference that they had hyped for a week. All they would say was that it would be an important discovery of something astronomers had been looking for for more than 50 years. Speculation was rampant, running from black holes to planets to dark matter to aliens. Even from my inside perspective, I had little information. All I knew was that it involved both X-ray and radio telescopes. The X-ray telescope involvement meant it had to be something with tremendous energy -- planets and aliens don't produce nearly enough X-rays for us to detect on Earth. What in the world could this amazing, earth-shattering discovery be? When it was announced yesterday, I felt a bit let down. The discovery was of the youngest known remnant of a supernova (exploding star) in our Milky Way Galaxy. This is both interesting and important, but I don't know that it is the culmination of a 50-year hunt, and I don't see why they kept all the secrecy about the press announcement, since the paper announcing the discovery was posted to our preprint server (a place where astronomers can put papers for each other to read before the journal with the official paper comes out) on April 15, one entire month ago. Granted, we did the same thing with our press release a couple of weeks ago, but we never tried to hype up some secret new discovery. If anyone had asked, we would have told them. But, NASA seems to get its jollies from hype, even though the science alone is usually sufficient to pique the public's interest. So, what is the science here, and why is it interesting (even without NASA's hype)? It stars with exploding stars. Supernovae, or the explosion of stars, are rare events. Various people have estimated how often a supernova should happen in the Milky Way, and the best guesses end up once every 50 to 100 years. But keep in mind that this is a long-term average; stars don't know when other stars explode, so sometimes you could have several supernovae go off in a short time frame, and other times you could get really long lags between supernovae. The last supernova in the Milky Way Galaxy seen from Earth was in 1604. This explosion, called "Kepler's Supernova", was observed by famous astronomer Johannes Kepler, but was before the invention of the telescope! Since then, the skies have been dark, although we are all ready and waiting for a new supernova. So, are we in one of the long lags that can sometimes happen? Maybe, but maybe not. 400 years is a long time, even given the rarity of supernovae. More likely is the fact that the Milky Way is full of dust that is great at blocking optical light. If a supernova were to happen behind one of the many dust clouds, it would be invisible in optical light on Earth, even though the supernova would outshine the entire galaxy! And since most of the stars in the Milky Way are located toward the center of our galaxy, which is hidden behind an amazingly thick layer of this dust, we would expect that many, if not most, supernovae in our galaxy would be invisible to human eyes. We have some evidence that this dust blocking has happened in the past. One of the brightest sources of X-rays in the sky is called Cassiopeia A, or Cas A for short. 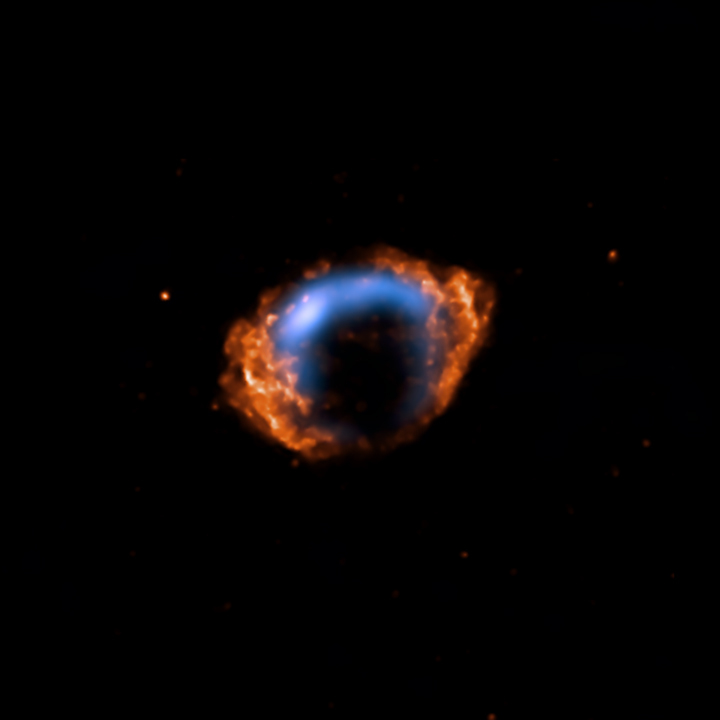 In X-rays and radio waves, Cas A looks like a supernova remnant -- a lot of material is shooting out from a common center at a very high speed, just like shrapnel from any explosion would. When we look at pictures of Cas A taken several year apart, we can see the expanding cloud of shrapnel growing in size. If we run time backward and see when all of the material was in the same spot (in other words, the start of the explosion), we estimate the explosion was 300 years ago. But no explosion was seen from Earth at that time, in spite of there being many astronomers with telescopes around the world. 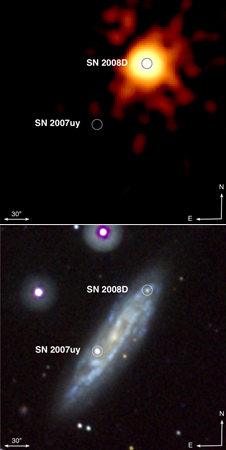 So, astronomers have been looking for other young supernova remnants. These would be bubbles of hot gas expanding at very high speeds. Since high-energy X-rays and certain radio waves can pierce through the dust in our galaxy, most searches fave used X-ray or radio telescopes. And by measuring the rate at which the bubble is expanding, we can again estimate the age of the supernova. Which brings us to yesterday's press conference. One supernova remnant with the less-than-exciting name of G 1.9+0.3 was studied with both X-ray and radio telescopes (the picture at the top of this page is the combined X-ray and radio pictures of this object; click on the picture to go to the press page for more pictures and information), and the estimated age of the explosion is only about 100-150 years. In other words, the explosion probably happened around the time of the U.S. Civil War, if not even more recent. There have been many astronomers with big telescopes around, but nobody saw the explosion. This is not surprising. The supernova remnant is located only about 1000 light-years from the center of our galaxy (whereas we live 25,000 light-years away), and is located in a region with lots of dust to block visible light. The explosion could easily have gone unnoticed by astronomers at the time. But the search for young supernovae is not over. There may be other very young explosions waiting to be discovered by the same method. Our galaxy continues for tens of thousands of light-years on the other side of the Galactic Center, and all that part of the galaxy has been invisible to our eyes until the invention of radio and X-ray telescopes. And we need to find these young remnants if we want to be able to estimate how often stars explode, which in turn is important for understanding what kind of stars do the exploding! Last, could we miss a supernova today? I think the answer is probably not, for two reasons. There are a lot of astronomers, especially amateur astronomers, who are constantly scanning the skies, looking for the faintest pinpoint of light that wasn't there the night before. Even with all of the dust in our Galaxy, these amateurs might be able to see a faint new star. And, in a decade or so, astronomers will have the LSST, a large telescope scanning the entire sky every few nights to look for new and changing stars. Second, we also have full-time neutrino observatories. Neutrinos are elusive subatomic particles that are produced in large numbers by supernovae, and they are not stopped in the least by dust in our Galaxy. In 1987, a supernova in the Large Magellanic Cloud (one of our closest neighbors in space) exploded, and we detected several neutrinos from that explosion. An explosion in our galaxy will produce many more neutrinos that we will detect, and we will know that, somewhere, a star in our galaxy has just exploded. And every professional telescope in the world would start scanning the skies for that explosion for the opportunity to bring modern astronomical instruments to bear on what will be the most exciting astronomical event in decades! Today marks my 500th post on this blog. What does this mean? First, that I'm halfway to one thousand posts. Second, that I have a lot to say, but not much that is important. And third, that you probably have a lot of catch-up reading to do. But, 500 is just a number, and only slightly more impressive than 499, and less impressive than 501. So, onward and upward! Today I saw this story saying that the Vatican says its okay to believe in aliens. Huzzah! But, wait, what does the pope really mean? First, the statement is not from Pope Benedict. It is from an interview with Father Jose Funes, the Director of the Vatican Observatory. I met Fr. Funes when I was working at Steward Observatory in Tucson, AZ. The Vatican Observatory has some offices in the same building on the campus of the University of Arizona, and they have a telescope on the same Arizona mountain where the Large Binocular Telescope is located. Fr. Funes is a good man and a solid scientist. Second, Funes's statements don't mean that the Vatican is claiming to know that there are aliens in the Universe, but that he feels that if aliens exist, their presence is reconcilable with Christian beliefs. I think it is laudable that the Catholic Church is trying to stay ahead of the game, after centuries of supposed opposition to scientifically-proven facts (this was more an appearance than truth, but the Catholic Church has many times failed to make clear that it accepts most scientific findings, and has made some notable mistakes). Third, the statement is only addressing the existence of alien life somewhere in the Universe, and is not making any claim about UFOs or alien visitors to Earth. While most scientists have come to believe that life may be common in the Universe, the overwhelming majority don't believe that Earth has been visited by aliens (myself included). As for myself, I am not Catholic, so I can't comment on what the interview might mean for members of the Catholic Church. But I think it does help to show that the antagonism between science and religion does not need to exist. Science is very good at exploring how the Universe works, but the rational philosophy behind science is not always useful. For example, science is not able to address emotional or moral issues. Sure, science might be able to tell us about the biology of love and hate and conflict and peace, but it cannot make value judgements. Religion is one way of addressing those value judgements. But religious beliefs do not explain the workings of our DNA or the plumbing of volcanoes. Too often, scientists take quite irrational stances against religion,often in response to irrational stances taken by deeply religious but scientifically ignorant people, and a never-ending spiral of talking past each other and illogical arguments and slanderous statements and general pig-headedness prevails. I long ago stopped trying to be a moderating voice in the discussion, because people on both sides of the issue took a "you're either with us or against us" view, an attitude that produces little progress but copious quantities of bitterness wherever it arises. I laud Fr. 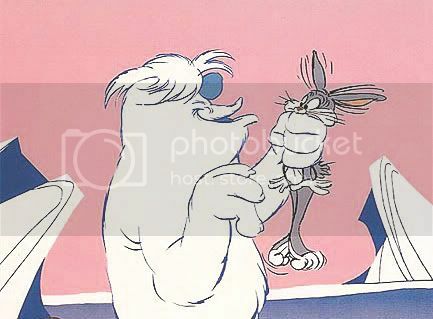 Funes and others who are a bit braver and thicker-skinned than I am, trying to bring some ounce of sanity to a discussion too often sabotaged by extremists on all sides. Yesterday I drove back across Texas after a fairly frustrating observing run at McDonald Observatory. As I've mentioned in my last few blog posts, the problem was clouds. I've dealt with clouds on many runs in the past, but this run was all the more frustrating because the clouds were quite patchy. So, it would look like it was clearing up, but then the clouds would roll back in again. There are some types of observing that can be done in partly clear weather. If you are just taking pictures or are taking spectra (splitting the light up into its component colors), you can usually work through clouds. If a thick cloud rolls over, you just close the shutter on the camera, wait for the cloud to pass, and then open the shutter again. It's not ideal, but it works. My problem was that I was trying to do time-series photometry, or measurements of the brightness of a star as a function of time. The analysis of such information requires long stretches of uninteruppted data, three or four hours at a time. It's okay if some thin cirrus (the high, whispy clouds) are drifting overhead, but when the clouds are thick enough to block all light, you're in trouble. One or two of those thick clouds can be dealt with, but I had thick clouds overhead every 10 minutes or so. And that just doesn't work. So, out of four nights at the telescope, we got one night of good data. We really needed two or three nights of data for what we were trying to do. And now we will have to wait a year for this target to come around again. Oh well, this happens. I'm spending my second night in a row watching thick clouds roll by over our telescope. The night started off with another sucker hole, so we got ready to try and observe. But then the clouds started rolling in, and that pretty much ended things. Tomorrow is my last night, and it isn't looking very hopeful right now. I hope the weather is wrong -- it is not a good feeling to come away with only one night out of four. So, I'm trying to stay up as late as I can, just in case tomorrow night is clear I'll still be on a night schedule. I've been trying to catch up on work, but I am so hopelessly behind, I'm not making much of a dent! Tonight has not been a fun night at the telescope. At sunset, it was completely cloudy, but the cloud forecasts from the Clear Sky Chart claimed it would clear by 1am, so we hunkered down. Within an hour, the skies overhead cleared, so we opened the dome and started our observations. However, the clear spot was what is known as a "sucker hole," meaning you are a sucker to think you can get good data. After about 45 minutes, the hole closed, and the skies have been mostly cloudy ever since, always teasing to clear, but never good enough to start working. In another half hour, I'm giving up if it is not clear. Our observations need several hours to be worthwhile, and it is four hours to dawn now. I could be trying to work, but sometimes no data is better than bad data. Hopefully tomorrow will be better! It's been a busy few days here. Tuesday I went to speak with students in a couple of high school astronomy classes in Kyle, Texas (a little south of Austin). It was an interesting experience. Some students were interested in what I had to say, some were interested in asking me questions but on topics other than what I was talking about, some were bored and passing notes or texting during class, and others were sleeping. That visit was a lot of fun. but it took a lot out of me. I would not be able to get in front of that group every day, though. Wednesday I drove out to McDonald Observatory for a weekend of observing. The drive was worse than normal. I had a 30 mph headwind, with occasional gusts that nearly blew my poor little car off the road. Because of the headwind, my gas mileage wasn't very good, and I slowed down to keep better control of my car. In the end, I arrived too late for dinner (but there were leftovers). My goal is to do some more observing of our pulsating carbon atmosphere white dwarf. In order to use these pulsations, we need to get many nights of data spread out over time. This is our first real push to get lots of data on this star since we discovered it. So, keep your fingers crossed for good weather. We may get a lot of clouds here later tonight and the first part of tomorrow night. Image Source: H. J. Heinz Company We knew that our press release from last week was not the most earth-shaking astronomy news ever. We put the story out there in the hopes that someone would find it interesting, and to advertise some of the new findings that your tax dollars are helping to pay for. It being the first press release I was directly involved with, I have done some Googling of the news to see where our story ended up. Our story was picked up by Discovery Channel News, who even linked to it from the Discovery Channel's home page for a time. That was cool. And some other space blogs picked it up, as well as several foreign news aggregators (news outlets that seem to automatically or semi-automatically pick up news stories and publish them; since the stories are all identical to our press release, I'm not sure a human actually looked at them). I was kind of hoping that a few astronomy news sources might mention our story. I often link to and talk about stories in Space.com, Sky and Telescope magazine, and Astronomy magazine, so I kept an eye out there. Nothing. Which is their right, and, as I said, our story is an interesting sidelight of astronomy research, and probably not the most Earth-shaking discovery of the year. However, I did notice some of the stories that got posted around the same time, and they serve to just about completely burst our bubble. Space.com ran a story on how some data from an experiment related to ketchup physics was recovered from the debris of the Space Shuttle Columbia. While I fully admit that this is an amazing data recovery and that the Columbia disaster remains far more newsworthy than anything I've done, ketchup?!! Some other white dwarf news also beat us out. A story on a supercomputer that will study exploding white dwarfs got some press, too. The computer has only been built; it doesn't have results yet. So, the promise of what may eventually be crucial studies of white dwarf explosions beat out our real data. Oh well. In the grand scheme of things, this doesn't matter. But maybe next time we should put a little more shine on our work. Like promising to lift the federal white dwarf tax for the summer, or pointing out how terrorists could wreak havoc with a cube of white dwarf material (never mind that they couldn't obtain it), or speculating on how a white dwarf superdelegate might vote for president (probably for the most degenerate candidate). Yesterday I blogged about the new pulsating white dwarf my collaborators and I found. Or at least we think it is a pulsating white dwarf. We're pretty sure, but we aren't absolutely certain. How do we know that we may not know what we're looking at? And what else might this be? And why did we put out a press release if we might be wrong? First, there are a couple of things we are pretty certain about. We know we are looking at a white dwarf, and we know that all we see of the white dwarf is carbon. We also know that the amount of light coming from the star is changing by a few percent every 7 minutes, and that variation is very repetitive and stable. We also know that theory predicts that this white dwarf should be varying, assuming we have its temperature and mass right. If this were all the information we had (and it is 90% of it! ), there'd be no doubt in our minds that this is a pulsating white dwarf. The white dwarf rapidly gets brighter, gradually fades, and then stays faint or a bit before getting brighter again. Complicated but expected physics that I won't try to explain gets you this shape. To my eye, this looks more like the upside-down version of the normal pulse shape. In fact, at first we checked and re-checked our data to make sure that it wasn't backwards. But this is right, and it is totally unexpected. There are objects in the universe that vary their light with this shape, but most of them we wouldn't mistake for our white dwarf. There is one type of object that worries us, though -- it's a star called AM Canes Venatici (which we give the nickname AM CVn, and pronounce it like "AM Can Van"). AM CVn is a big white dwarf that is slowly eating its neighbor star, which used to be a little white dwarf made of helium. When AM CVn was first discovered, it was thought to be a helium-atmosphere pulsating white dwarf. It took a lot of careful observations to learn the truth. And there are some eerie similarities between the story of the discovery of AM CVn and our discovery. But, if our star is like AM CVn, it also must be different. Instead of a big white dwarf eating a little white dwarf made of helium, our star would have to be a big white dwarf eating an almost-as-big carbon white dwarf. Now, let's imagine that our white dwarfs were fish in the sea. A big fish has no problem eating a little fish, but two big fish usually don't try and eat each other. If they did, they'd get in a fight and rip each other apart. In this case, the fish are white dwarfs, and the eating is done with gravity instead of teeth. And if our star were really two white dwarfs trying to eat each other, computers tell us that their mutual gravity would rip each other apart in a matter of seconds, and the debris would quickly fall back together into a single big white dwarf (or perhaps even explode as a supernova). And while the computer models may well be wrong, these same models get a lot of other things right, so we tend to trust them. So, in short, we are pretty sure we have a pulsating white dwarf. We predicted it, looked for it, and found it. Nature would have to be pretty perverse to make our star yet another type of oddball object. Nature does sometimes play tricks on us (or, more often, we are a bit too clever for our own good and fool ourselves into believing something that is not true). And the ony evidence that this is not a pulsing white dwarf is the weird shape of the pulsing. It is possible to explain the weird pulsing within current theories, it's just that we've never seen it in a pulsing white dwarf before. I would estimate that 85% of the evidence says that this is a pulsing carbon-atmosphere white dwarf, and that's pretty good. Why did we make a press release when we could be wrong? A couple of reasons. First, we are pretty sure we are right. 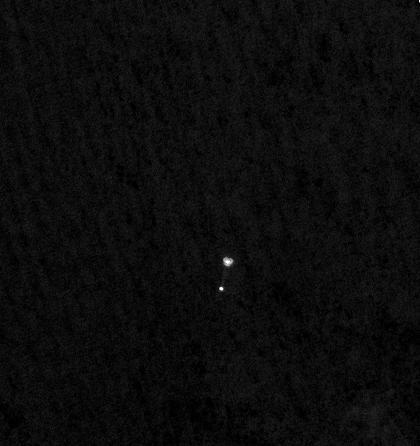 I wouldn't bet the farm that we have found a pulsating white dwarf, but I'd be willing to bet a fair amount of money. Second, the other option -- two big white dwarfs trying to eat each other -- would be even more exciting. None of those are known to exist, and, as I said, they could explode as a supernova. Either way, we've found a very interesting object, and we wanted to share that excitement with people outside of our professional colleagues. The faint blue dot in the center of the picture above is a white dwarf, the ashes left behind after a star used up all of its nuclear fuel and completed its life. Tens of thousands of white dwarfs are known (and tens of billions exist in our galaxy), but this particular one is unique among the known white dwarfs. About a year ago, a collaborator of mine discovered that a small fraction of white dwarfs have carbon atmospheres. Most white dwarfs have atmospheres composed mainly of hydrogen, and almost all of the rest have atmospheres made up mostly of helium (and by mostly, we mean more than 99% of the atoms). The reason for most white dwarfs having these two atmospheres is that these are the two lightest elements in the Universe, and the gravity of white dwarfs is so high that it can separate the atoms in its atmosphere in a matter of days or weeks. So, if there is even the tiniest amount of hydrogen in an atmosphere, it will rise to the top and be the only thing we can see from Earth. So, carbon atmosphere white dwarfs (which make up only about one in a thousand white dwarfs) tell us that these white dwarfs have somehow lost virtually all of their hydrogen and helium. This is strange and hard to explain. In fact, none of the guesses for the origins of the atmospheres of these white dwarfs are really that well-developed, and these guesses are all lacking in evidence. What we really would like is to get inside the star, and see its internal structures. That would tell us a lot about what sort of processes went on in the star before it became a white dwarf. Amazingly, there is a way to look inside a star -- it's called asteroseismology. Some stars can ring, like a bell, as sound waves move around and through the star. And just like geologists can study the interior of the Earth by examining the "ringing" of the Earth due to events like earthquakes, we can use the waves on stars to probe their inner regions. Helioseismology, or the study of sound waves in the sun, has told us a lot about the sun and confirmed some of our most basic theories of the structure of normal stars. So, one day I was wondering if these carbon-atmosphere stars might be susceptible to this "ringing," (in white dwarfs we call this ringing pulsating) and therefore able to be studied by asteroseismology. Luckily, one of my friends and colleagues here at the University of Texas, Mike Montgomery, is an expert in the theory of white dwarf pulsations. So, I asked him if these stars would pulsate. He went off, ran some simple models, and decided that they might pulsate under specific conditions (depending on the star's temperature). It isn't too hard to find pulsating stars. The waves in the star act as though the atmosphere is sloshing around the surface of the star. When the gas piles up, it heats up a bit, and where it has left, the star cools down a bit. Where the gas is hotter, the star glows a little brighter, and where it is cooler, the star is a little fainter. So, as we watch the star from Earth, we'll see brighter and fainter spots moving in and out of view, and the star will appear to get a little brighter at some times, and a little fainter at other times. This brightening and fading happens on time scales around a few minutes. So, if the star is bright enough to take a picture of every 15 to 30 seconds or so, we can see the star actually changing brightness. Mike and I then went and asked for telescope time to look at some carbon-atmosphere white dwarfs. Only one white dwarf appeared to meet the right conditions to pulsate, and the rest looked like they should be quiet. This made for a great test that scientists talk a lot about: we have a theory to test (if the stars pulsate when their temperatures are in the range that Mike calculated), a test sample that includes "control" stars (those that shouldn't be pulsating), and a experimental procedure (to look at them with a telescope). So we were given telescope time in February. Both Mike and I were busy on the days we were given (I was in England at a conference), so we got a grad student, Steven DeGennaro, to go run the telescope for us. Steven spent the first few nights looking at our control stars (we didn't tell him which one was likely to vary). That was quite boring, because they didn't do anything. Hours upon end, they looked identical from one picture to the next. This is what we expected, but we wanted to be sure. You can see that the star is getting brighter and fainter in a fairly regular fashion. In fact, the star is ringing at just two pure tones one octave apart. If we could hear sound across space, the star would be singing strongly at a slightly out-of-tune E-flat 16 octaves below middle C, with a softer overtone one octave higher. Alas, in space, no one can hear you sing. This was exciting -- Mike had made a prediction, we went and looked and confirmed the prediction! We then wrote up a short paper on our discovery, which appears in today's edition of the Astrophysical Journal Letters. The other types of white dwarfs (hydrogen-atmosphere and helium-atmosphere) have been known to pulsate for over 25 years, so this marks the first new type of pulsating white dwarf in 25 years. For that reason, we decided to put out a press release announcing our discovery. So, you may very well read about this in the newspaper. Maybe. Really, it is hard to tell in advance what people find interesting and what they don't find interesting, so maybe no newspaper will pick up this story. But we put it out there, in the hopes that someone may enjoy the tale. Tomorrow, I'll try and talk about why we may be completely wrong. I don't think we are, but we have to admit that possibility for now.